Posted on August 7, 2018 at 3:55 pm. If you have been researching design ideas for a new kitchen project then you most likely have come across the term ‘transitional design’. It is a design concept that is by far our most requested style when it comes to kitchen design. Transitional design is essentially traditional style mixed with just the right amount of contemporary flair. The combination of styles will deliver a timeless design that you will be able to enjoy for years to come. Cabinetry color is one way to express a transitional design. Often times the color choice will be of a white/off-white, grey or an earthy tone such as beige or tan. It is also not unusual to see a mixture of colors; a white perimeter with a grey island can capture the transitional elements quite nicely and it can be very pleasing to the eye. Simplistic door details are popular with transitional design. This can mean anything from a flush inset cabinet with a classic shaker doorstyle to something with a more traditional door bead. Keeping things minimalistic and streamlined in the design will result in an ideal transitional design. 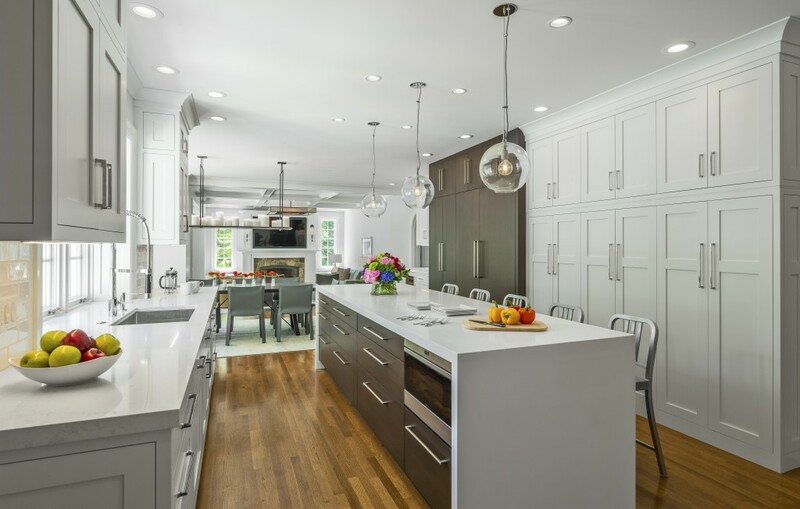 It is a wonderful concept for New Englanders who are often times trying to marry their classic style home with a sophisticated new kitchen. Transitional design can create a seamless link between both ends of the spectrum. Hardware choice can play a large role as well, yet it’s often overlooked in the design process. You could easily pull a bit more contemporary, if that is your desire, by choosing a more modern knob or pull for the cabinetry. On the other hand, you could choose a warmer and more classic knob or pull and it will bring the design closer to the traditional style. Whether you choose to head down the transitional avenue, or keep with a more traditional or modern style, we can be of great assistance when ironing out all of the details for your design. We would be more than happy to speak with you about all of the available options.